This one was a long time in the making as MS should've added this control back in 1703 already but it should help in situations when turning on HDR in Windows results in a completely unusable desktop. For those unaware of the issue, Windows 10 1703+ HDR mode renders everything SDR (which basically means all PC applications including the desktop itself and SDR games) with 100cd/m^2 brightness. Depending on where this brightness level is on your particular HDR screen it may result in SDR content being too dark, washed out or both. 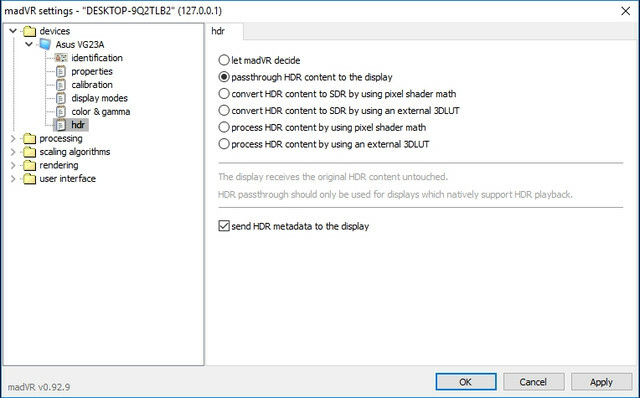 This setting should help HDR users on PC to tweak the default system level of SDR white which in turn should make the desktop, applications and games a lot more usable in Windows 10 HDR mode on a wider number of HDR displays. Those of you who are using Insider builds and have issues with HDR in current Win10 release should check this one out. Any change for games that HDR was not working right? Could you give some examples and also specify what output mode they didn't work right? Thank God. I tried setting up HDR on my PC connected to my TCL display, but everything looked too damn dark. Hopefully, this should remedy that problem. Hopefully this works properly. Up till now I would only enable HDR when wanting to view hdr content. So far I'm using HDR on PC only via MadVR plugin that automatically turns on HDR mode when viewing HDRvideo files. * - theoretically fullscreen enhancements should make this automatic but sometimes they don't. If this doesn't work then there's some s/w problem. I guess that's better than nothing. Still, text doesn't render properly on desktop applications on any of my HDR displays when HDR is enabled, and I'm afraid being able to tweak the "dynamic range white level" won't fix that. In any case, I wish they'd just go back to dealing with HDR content on a per application/game basis. I can only speak for myself, but I have absolutely no need for an HDR-enabled desktop at this time. 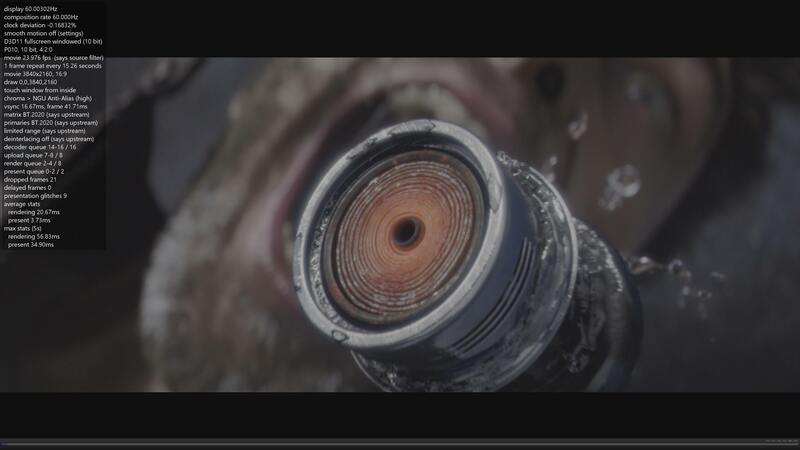 Wont know if worth until we test it. It's inevitable that the desktop will have to support HDR. Both YouTube and Vimeo provide HDR videos now, for example, and if you want to view them inside your browser with HDR being active you'll need it to work in DWM. As for the text issues these are probably because of 4:2:2 chroma which is a limitation of HDMI 2.0 interface. Absolutely, that's where all of this is going eventually. I just feel that the way Windows 10 handles HDR currently is more of a hindrance than a benefit to me personally, so I've just disabled it altogether for now. With any luck we'll have this sorted out within the next couple of years with HDMI 2.1-capable displays, video cards, etc. Sorry for the thread bump, but how do I enable this? I have MadVR and MPC-BE all set up. Settings > Video > Video renderer > select madVR. Then go to external filters tab, disable ffdshow raw video filter, click add filter, select madVR and set it as preferred. In my external filters tab it's just LAV audio and video decoder? Well, i just mentioned this because ffdshow raw video filter blocks madVR HDR passthrough, but if you don't have it, that's ok. However, you still need to add madVR as external filter and set it to preferred. You can, since i find OS HDR to be more reliable then AMD/Nvidia (just make sure to use default output color settings in control panel. ), although it shouldn't be necessary with latest graphic drivers and madVR build. Thanks a lot for your help :D I didn't even know about NVIDIA having support for HDR without the need for enabling it in Windows Settings. also I only recently discovered that you can enable HDR for extended displays only. It's a god send. I have am issue with Hitman where on default color settings the game says I don't have a HDR capable tv (own LG c7), so I get no HDR availability in game. I'll try with 422 settings later tonight. I switch from an HDR TV to a non HDR 21:9 monitor and Everytime I would load a non HDR game on the TV it was a complete crapshoot if it would display properly or get all fucked up and washed out. FFXIV was fine, then it wasn't, then I toggled AA to off, and it was fixed, then switched back to my monitor, and then back to the TV and no setting would get it to display the proper SDR brightness value. It was always washed out no matter the setting. I have a Ryzen 1600 and GTX 1070. For whatever reason I can't even turn on the HDR toggle. Why is that the way to do it on PC? Why can't it just auto-switch like every other device? Do you have latest drivers (390.65) and madVR build (0.92.11)? Oh my MadVR is 0.92.10, how do I update it? True story: the last Windows 10 update killed my office PC and almost costed us a lot of invaluable data we didn't backup in time (records of all the subscribers to our gym in the last 6 months). In the end I managed to salvage what was really important by connecting my HD to another PC and copying few folders directly. But I had to format that HD for any chance of it to work again as a boot drive. - always back up your important data, as a general good rule and especially before updating Windows. You can actually just delete the madVR folder and replace it with the new one. That's what I ended up doing, and it gave me the HDR option. It's not in the "external filter" setting either. It's under the first tab, which is "devices" that shows the current monitor you're using. Expand that, and at the bottom you should have an HDR option to tick. Edit the options by opening up madVR while it's running. Don't do it through KCP or whatever if that's what you're using as a package. edit: Not sure how the version numbers work with madVR, but 0.92.9 works, so I'm assuming that's simply a "9" and not a "90". So you should already have the version that works. It also seems to be more reliable to simply set it to "passthrough HDR content to the display". You can always download latest version form here, then just copy & paste in install directory. EDIT: Enabled HDR in windows settings and played a file, went fullscreen and its still dark and washed out. Damn. Ignore the Windows setting for now (you might need to reconsider later with the next update however). Keep it off and set it up in madVR to passthrough HDR to the TV. Make sure the "send metadata to the TV" box at the bottom is checked too. Good to see Windows working on this. Don't have any HDR displays yet, but I'll be getting one this year most likely. It works automatically for me, just need to switch to madvr in the player, and put the desktop color to "default" in nvidia settings. Colours a lot nicer direct from TV. Oh well. HDR support on Windows is terrible imo, ffs Microsoft. Can anyone explain to me why HDR is handled by the OS and not by the video drivers like any other graphical option? What do you mean? HDR is a display mode and it's an OS task to request and support any display mode. Driver is only providing the interface through which the OS can access some mode of the h/w. That being said, I've seen reports that the latest 390.65 driver has fully restored NVAPI HDR support in both 1703 and 1709. Yeah, Andromeda still doesn't work. Tried exactly as stated above and nope. Obviously an issue with the game but as it's no longer being supported it'll never be fixed. Does this mean HDR can function how it did prior to the Creator's Update? I can't check this myself but in theory yes, it should. Sounds good. I'll test this tonight and report back unless someone beats me to it.